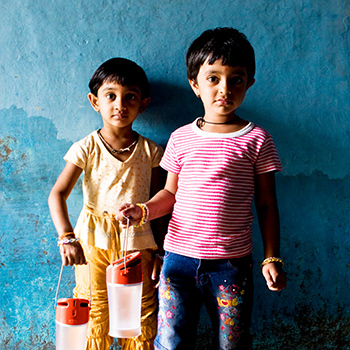 Turn on the LIGHT for Children in India! You Can Help Provide the Gift of LIGHT to Dispel the Darkness in India! Help "turn on the light" for children and their families in India who can't afford even one electric light that would make life (and study) so much easier. In remote villages there IS no electricity -- so nights are spent in virtual darkness that makes it difficult for children to study their school lessons. Your gift of $18 will provide a quality solar-powered lamp for a child and his or her family -- and you will help demonstrate Christ's love and encouragement to these impoverished families. Your gift of $72 or more can provide lamps for four or more families who cannot afford this simple, effective and life-changing gift.